POWER-WEB is 14" in diameter and weighs sixteen ounces. Its unique patented design allows a variety of exercises to be performed comfortably and effectively. Constructed of high quality rubber with special agents added for durability and strength, the POWER-WEB will last for years (with proper use and care). 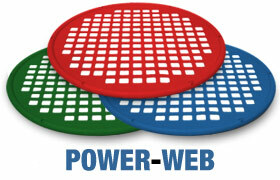 POWER-WEB is available in 6 resistance levels including a non-latex level 2. POWER-WEB JR is 7" in diameter and weighs eight ounces. Just half the size of the original POWER-WEB; it has all the same features as the larger product and delivers many of the same benefits when used in a hand and wrist rehabilitation exercise program. 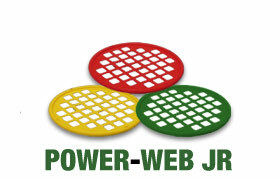 POWER-WEB JR. is available in 3 resistance levels. POWER-WEB COMBO offers a unique advantage of two resistance levels in one, offering greater flexibility and value. It is identical in size, band, and weight as the original POWER-WEB and made with the same high quality construction and materials. 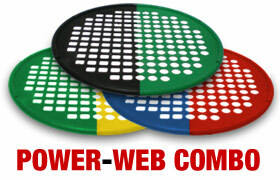 POWER-WEB COMBO is available in a combination of two resistance levels from various POWER-WEBS. A real challenge for advanced strengthening, used where hand strength is vital - such as karate, weight lifters, golf, baseball, football.